VIN SCULLY IS MY HOMEBOY: Dodgers Opening Day - April 10! Dodgers Opening Day - April 10! Opening Day @ Dodger Stadium will be on Tuesday April 10 against the Pittsburgh Pirates! No games @ Yankee Stadium. Interleague schedule includes the Angels, White Sox, Mariners and A's. 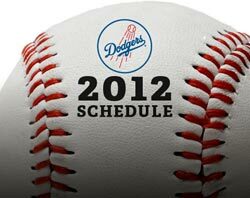 Click here for the 2012 schedule.